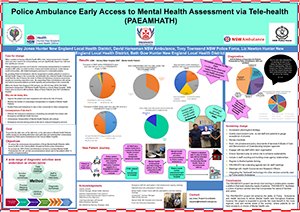 Hunter New England Local Health District (HNELHD) provided iPads to police and ambulance staff, so they can access mental health triage and support for consumers at the scene of the emergency. To reduce unnecessary transportation of mental health consumers to Calvary Mater Newcastle Hospital, by 50% within 12 months. Helps NSW Police and Ambulance NSW deliver best practice mental health care in the community. Improves timely access to mental health support and interventions for consumers. Delivers specialist, evidence-based mental health information and recommendations to police and ambulance staff. Reduces unnecessary transportation and presentations of mental health consumers to hospital. Maximises resources through the use of telehealth technology. Increases awareness of mental health care among police and ambulance staff. In 2014/15, NSW Police and Ambulance NSW transported 60% of mental health consumers who called Triple Zero in HNELHD. Of those who were transported, 46% were not admitted to the Psychiatric Emergency Care Centre or emergency department (ED) at Calvary Mater Newcastle Hospital. People who are not admitted are often left to find their own way home, which can be difficult for those transported without money, a phone or family in the local area. In some cases, the ED will pay for a taxi or hire car, but this is at the hospital’s discretion and is not common practice. Transporting consumers who did not need to be admitted to hospital was a drain on both time and resources, with police and ambulance staff often taking up to four hours to care for each person. This time was spent waiting at the scene for the ambulance to transport the consumer, which can be considerable as mental health consumers are considered a low priority for emergency transport. There was also travelling time of an hour each way (3-5 hours each way for remote areas) and time spent in the hospital waiting to complete handover, which can take between 20 minutes and two hours. This led to a number of associated risks, including a lack of medical emergency services in areas serviced by only one police car or ambulance. For mental health consumers and their loved ones, the process of waiting for the police or ambulance and being transported to the hospital and back home again was traumatic and unnecessary, negatively impacting their health and wellbeing. It was also costly, resource heavy and inefficient for NSW Police, Ambulance NSW and Calvary Mater Newcastle Hospital. Two sets of mental health checklists were developed in consultation with emergency services, community mental health teams and the Consumer Unit Manager. They identify whether consumers require a telehealth triage or should be transported to hospital. The checklists align to existing police and ambulance policy and procedures and were signed off by the project steering committee. 10 iPads were provided to participating police and ambulance staff, allowing them to complete the checklist at the scene of the emergency. The project officer did a ride-along with both services, to understand training needs and set up the devices to suit emergency services’ use. Face-to-face training was provided to all participating staff, with ongoing meetings to keep new staff or those returning to work updated on best practice. If the consumer required a telehealth triage, police or ambulance staff were able to connect to the Mental Health Contact Centre located at James Fletcher Hospital in Newcastle, using the iPad. The project was trialled with mental health consumers who were in a degree of crisis but not acutely unwell, and were over the age of 18. The service was available 24 hours per day, seven days per week. ease of use of telehealth triage via interviews with the Mental Health Contact Centre. uptake of recommendations for patient care and transport. whether presentations result in an admission to hospital. As of 15 July 2017, 17 consumers have been referred to a telehealth triage and two were transported to hospital—one with a diagnosis of hyponatremia and one who was admitted to the Psychiatric Emergency Care Centre. 15 consumers were deemed safe to stay in the community and were all followed up by either a community mental health service, general practitioner or psychologist. 'Useful tool. Very professionally done and I was impressed with the clinical nurse who triaged the patient via telehealth'. Interviews with consumers early in the project showed that for some, hospital is where they want to go when feeling unwell because experience has taught them it’s where they need to be to feel safe. It was initially assumed that everyone would want to stay away from hospital if possible, so this feedback helped the project team define the scope. While all organisations saw the value in the project, it took time for participants to gain confidence when using the system and not default to doing it the traditional way. Individual checklists and communication plans were developed for each agency, as it was identified that one size did not fit all and the culture is very different in each organisation. It’s important to engage consumers from the very start of the project and not settle for anything less. Sponsors need to be well-versed and confident in the project’s direction, for media and public engagement opportunities. Always refer back to the aim of the project and ensure the consumer remains the focus throughout the project. It’s important to remember that project teams are made up of people with lives outside the project, each with their own skills and experiences. While it may be tough, working together towards a common goal is both rewarding and fulfilling. Agar-Jacomb K, Read J. Mental health crisis services: what do service users need when in crisis? Journal of Mental Health 2009; 18(2): 99-110. Allen MH, Carpenter D, Sheets JL et al. What do consumers say they want and need during a psychiatric emergency? Journal of Psychiatric Practice 2003; 9(1): 39-58. Grubaugh AL, Cain GD, Elhai JD et al. Attitudes toward medical and mental health care delivered via telehealth applications among rural and urban primary care patients. The Journal of Nervous and Mental Disease 2008; 196(2): 166-170. Lamb R, Weinberger L, Decuir W. The police and mental health. Psychiatric Services 2002; 53(10): 1266-1271. Luxton D, Pruitt L, Osenbach E. Best practices for remote psychological assessment via telehealth technologies. Professional Psychology: Research and Practice 2014; 45(1): 27-35. Yellowlees P, Shore J, Roberts L et al. Practice guidelines for videoconferencing-based telemental health. Telemedicine Journal and eHealth 2009; 16(10): 1074-89. 1233 ABC Radio Media Interview with Leanne Johnson, General Manager Mental Health Services, HNELHD, 26 April 2017.